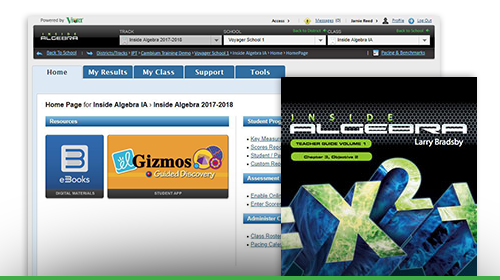 Inside Algebra is the intensive Algebra 1A & 1B curriculum designed for students who struggle with mathematics and need more than the average core. This Adoption Review Site was created for Florida educators to learn more about the Inside Algebra pedagogy and to review all components in a digital format. Please begin your review by downloading and printing the Reviewer Guide. Thank you for your consideration. We have created a comprehensive Reviewer Guide with step-by-step instructions for the digital review process. Please download and have this guide available before you begin to review. Please watch this brief overview video to get an introduction to Inside Algebra before beginning your exploration. We have provided the following resources online to support your review of the materials.